Fused dichroic glass pendants make the best gift! Make a statement with handmade dichroic jewelry. All of my jewelry is made from thin glass and because of that, they are VERY light to wear! This gorgeous pendant can be worn with that favorite dressy outfit for a night on the town! It is absolutely PERFECT for making a bold fashion statement. You can even dress up your casual weekend wear, such as your favorite pair of jeans and top. 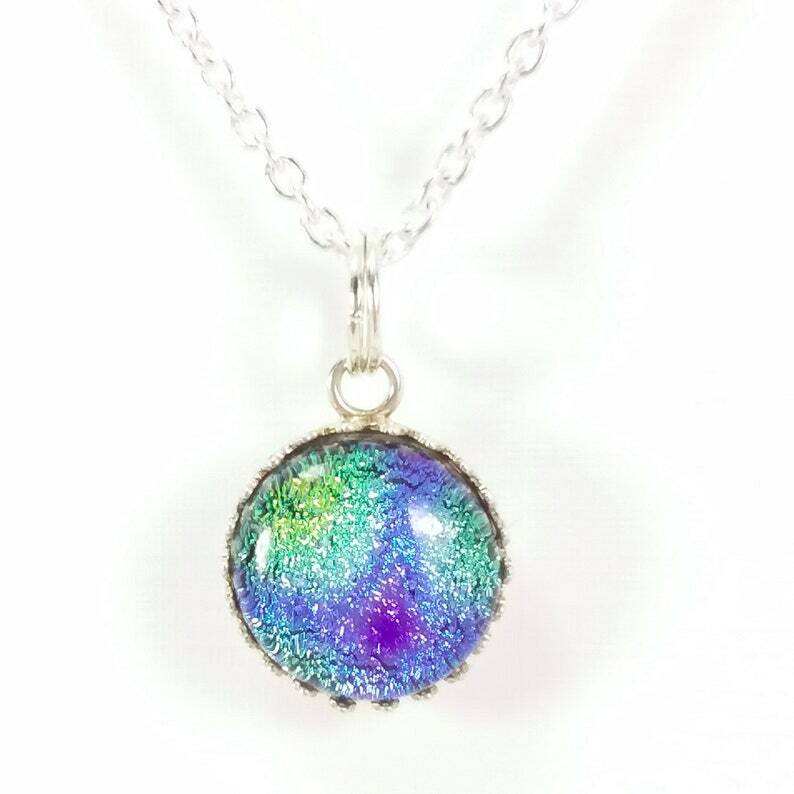 Dichroic pendants are very versatile for that jewelry lover in your life! Dichroic pendants NEVER go out of style! They are always fun, trendy, unique and oh so beautiful! This unique piece has beautiful colors of light blue, periwinkle purple, lime green, and various hues of blues and greens. Set in a fun Sterling Silver "lacy" round setting. So very pretty and comes complete with an 18" silver plated chain. Instant enjoyment! This pendant measures -5/8" diameter. Jewelry will be carefully wrapped in cotton-lined box with pretty ribbons! Made with LOVE and great care in my smoke-free home studio. Great for birthday gifts, wedding favors, bridal showers, or a gift for yourself! Ideal for ladies who love beautiful handmade jewelry! Your purchase will be shipped within 24- 48 hours of your full payment by US mail. Estimated shipping times are 3-8 business days to USA. Please read my store policies for more detailed shipping information. Do you need this order for a gift? If so, please send me an email and I will send your gift directly to the recipient with a gift card along with your own personalized message. I can even gift wrap (FREE) if you choose! No problem! Contact me anytime by clicking the "Ask a question" button by the price above, and I'll get back to as soon as possible. Have a nice day! I put these on as soon as they arrived. They're just beautiful, light and easy to wear. They were sent very quickly. Very pretty; vibrant colors, well made and quickly delivered, thanks! Need a gift certificate for someone? Here in the link that will help you: www.etsy.com/giftcards . And yes, I do accept Paypal. PayPal payment is preferred for quickest shipment. PayPal eChecks must clear prior to shipping (usually 4-5 days after payment). If there are any problems with the package, please e-mail me within three (3) days of receipt and I will work with you to resolve the situation. I appreciate and thank you for your business! I work hard to create high quality jewelry that will bring years of enjoyment! I will ship to your PayPal registered address, unless you specify shipment to a different address. Your package will be mailed as fast as possible -- Usually within 24 hours after receiving payment (unless I have a notice in my shop announcement i.e. vacation). PayPal eChecks must clear before shipping. All items shipped USPS First Class (unless we make other arrangements). I'm not responsible for lost packages so please follow your tracking number. I combine shipping. All items shipped to the same address in the same package ship at one price ($2.54+ US / $9.50+ Canada / $13.50+ international). Actual invoice value will be posted on all international customs forms. Your jewelry will be mailed to you wrapped as a gift! They will arrive in a cotton-lined gift box and tied with pretty ribbons. Perfect for gift-giving! Then they are placed in a padded envelope with bubble-wrap and shipped safely "Home" to you! If you need something gift wrapped, just ask! I love to wrap! (Free service).